Eagle Superabrasives is an industry leading supplier of Superabrasive supplies. With an extensive inventory of over 6,000 CBN grinding wheels, Diamond and CDX, Eagle Superabrasives is a one-stop shop. Ninety-percent of orders are on location at our Hickory, NC, headquarters and are ready for same day shipping. We can even fill custom orders in as little as seven days. Don’t settle for subpar Superabrasives; contact the experts at Eagle Superabrasives for all your grinding needs. Synthetic diamond is the hardest material known to man, making it useful for working with non-ferrous, difficult to grind materials (DTG). It is incorporated into diamond wheels. However, all Superabrasives have a weakness; heat. 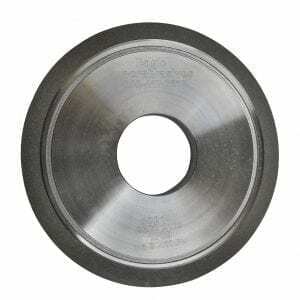 CBN grinding wheels are quickly becoming popular in the industry because of its desired characteristics. CBN shares many similar characteristics to diamond, however due to its much higher thermal conductivity, cBN out performs that of diamond in ferrous grinding applications. CBN crystals do not lose their cutting strength or structure until the temperature exceeds 1100-1200 Celsius. This combination of high strength and thermal conductivity allows grinding to be done at high speeds. Being able to grind at high-speeds and not lose performance is essential. We offer CBN wheels in three different bond systems: Hybrid, Resin and Vitrified. Considering the bond that is best to fit your needs is important, we recommend taking a look at our webpage of the breakdown of our bond systems. Click here to be directed. Our bonding systems and formulas ensures that our CBN grinding wheels stay strong and last longer. If you would like to read more about CBN Wheels click here. Whether you’re ready to order from us or need a quote, contact the experts at Eagle Superabrasives. Our experienced staff will provide support and advice along the way. With unparalleled customer service, superior products and fast shipping, Eagle Superabrasives is an easy choice for all your grinding needs.